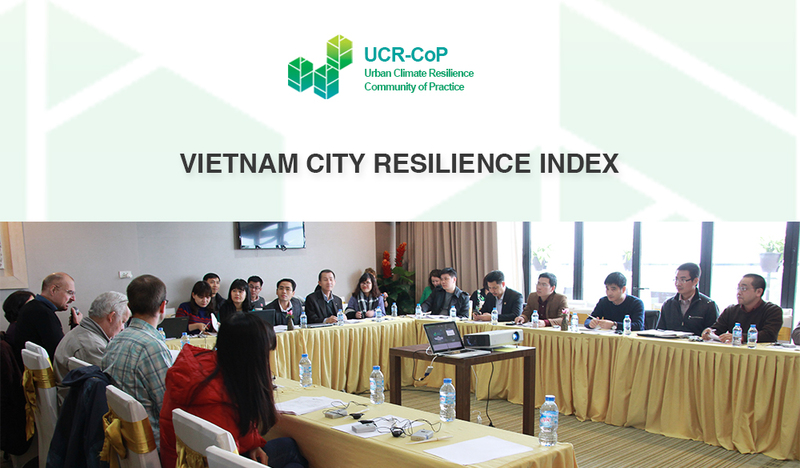 On Wednesday 16 December, members of the Urban Climate Resilience Community of Practice (UCR-CoP) met to share knowledge and thoughts on building an evidence base for decision making in urban planning in Vietnam. Topics covered included different data sources, combining different types of data to explain complex scenarios, and whether particular data are appropriate for particular indicators. The event was held in Hanoi with participants from Ministry of Construction, Ministry of Planning and Investment, the Asia Foundation (TAF), Universities, non-government organisations (NGOs), and consulting agencies in Vietnam. The UCR-CoP discussed these topics in the context of two presentations which can be downloaded from the Event page. 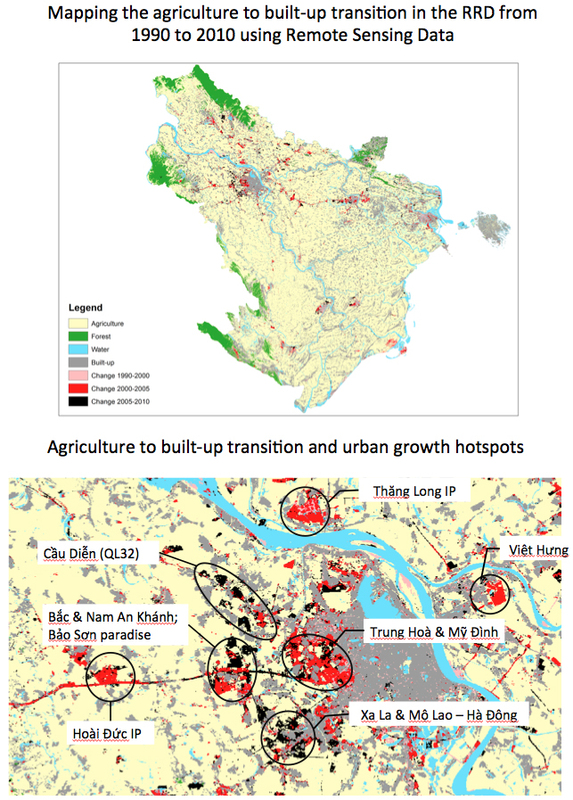 T he first presentation was provided by Dr. Duong of the National University of Agriculture and shared information on Mapping urban transition in Vietnam. The presentation and discussion included how valuable it is to identify areas that are peri-urban (i.e. when an area is transitioning from rural to urban). Dr Duong provided maps of Hanoi and Ho Chi Minh City that both had large peri-urban areas. It was also interesting to talk about what data can be used to classify an area as peri-urban. In this case, the study had looked at the source of household income, household sanitation systems, land use and vegetation density. From the presentation, it can be seen that there is a possibility to use remote sensing and spatial indicators to map areas in the process of developing Vietnam City Resilience Index (VNCRI) that would be shared in the next presentation. 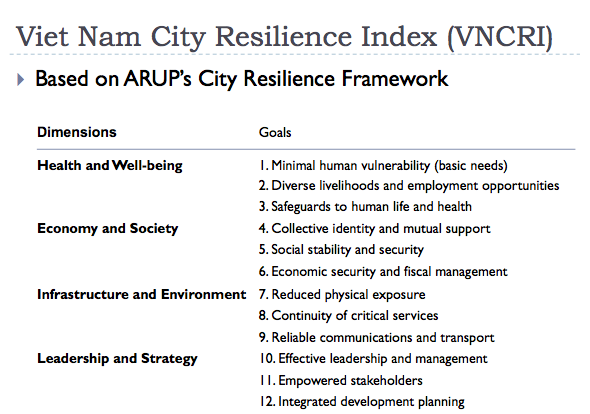 The second presentation was provided by Dr. Phong of the Institute for Social and Environmental Transition–International (ISET) and shared information on the development a Vietnam City Resilience Index (VNCRI). Dr. Phong introduced members to a draft of the VNCRI that ISET and TAF are developing in collaboration with the Ministry of Construction. 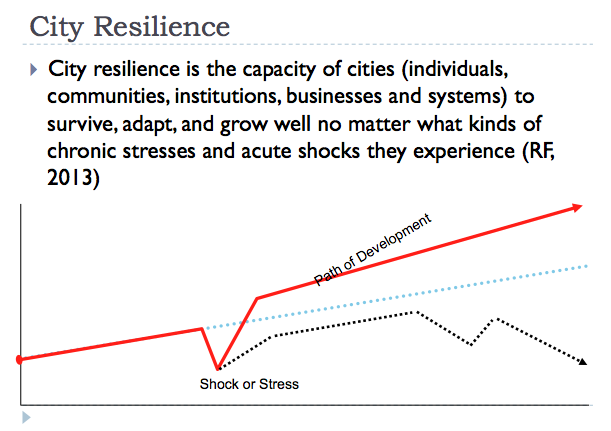 The Index uses ARUP’s City Resilience Framework as a base for identifying and developing indicators to measure a city’s capacity to cope with shocks and stresses. However, this project is developing an index specifically for decision making in urban planning in Vietnam. The UCR-CoP had a robust discussion about this work including matters such as how to choose the five pilot cities, the different types and sources of data that can be used, and how the information will enable better decision making. The information available through an index such as this will provide interesting and valuable information to all levels of government, urban planners, NGOs and related stakeholders. The UCR-CoP event included interesting presentations and informative discussions about the sources and provision of information. If you have comments or questions related to the information shared and discussed at UCR-CoP in general, please comment below or send emails to ucrmoderator@gmail.com. All UCR-CoP members will receive the detailed notes of workshop contents and related discussions. Many thanks for participating and sharing at the workshop and we hope to see you again in 2016. This entry was posted in Climate Change, English / Tiếng Anh, Meeting Briefing, urban planning, Urban resilience, Working Group Meeting and tagged Bien doi khi hau, city, climate change, Ministry of Construction, Resilience index, Urban planning, Vietnam. Bookmark the permalink.